Remedy: Consumers should immediately stop using the recalled Flushmate III systems, turn off the water supply to the units, flush the toilet to release the internal pressure and contact the firm to request a free repair kit. Consumer Contact: Flushmate at (800) 303-5123 between 8 a.m. and 10 p.m. ET Monday through Friday and between 8 a.m. and 6:30 p.m. ET Saturday, or online at www.flushmate.com and click on “Flushmate III Recall” in the black box on the top left of the page for more information. Description: This recall is for Series 503 Flushmate III Pressure Assist flushing systems installed inside toilet tanks that were manufactured from July 2009 through April 2011. 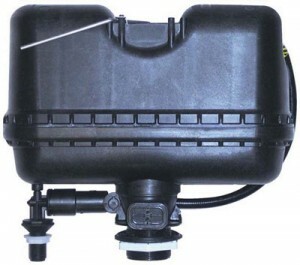 The units are rectangular, black, two-piece vessels made of injection molded plastic. Previously recalled systems were manufactured from October 1997 through June 2009. 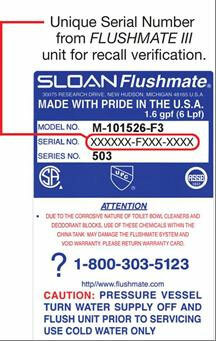 Recalled units have a date code/serial number that is 16 characters long and is located on the label on the top of the Flushmate III. The first six numerals of the serial number are the date code. The date code range for units included in this recall in MMDDYY format is 070109 (July 1, 2009) through 043011 (April 30, 2011). The date code range for previously recalled systems in MMDDYY format was 101497 (October 14, 1997) through 063009 (June 30, 2009). Units included in this recall were sold individually and installed in toilets manufactured by American Standard, Copperfit, Crane, Ecotech, Eljer, Gerber, Kohler, Lamosa, Mancesa, Mansfield, Orion, St. Thomas, Universal Rundle, Vitra, Vitromex, Vortens and Western Pottery. Incidents/Injuries: Flushmate has received two reports of the units included in this recall bursting, resulting in property damage, including one report of a minor injury. Sold at: Home Depot and Lowe’s stores, toilet manufacturers, distributors and plumbing contractors nationwide from 2009 through 2011 for about $108 for the units without toilets.